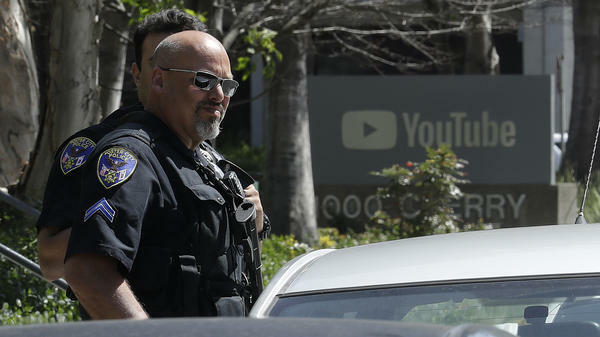 Police officers keep watch outside YouTube's headquarters Tuesday in San Bruno, Calif., after a woman opened fire on workers there. The shooter had vented her frustration with YouTube's recent decision on advertising revenue. Police questioned Nasim Aghdam in her car just hours before she opened fire on YouTube headquarters on Tuesday, wounding three people and apparently killing herself, the Associated Press reported. Over the course of a 20-minute interview, Aghdam calmly explained to officers that she was sleeping in the vehicle because she was having family problems and had left home. She never brought up YouTube or her rage against the company. Nor did she give any indication she was a threat to herself, the news service said. The Bureau of Alcohol, Tobaccao, Firearms and Explosives Wednesday conducted searches of multiple locations around the San Diego area associated with Aghdam, including homes where she'd previously lived as well as several vehicles, spokeswoman Ginger Colbrun told NPR. "Agents also completed an urgent trace on the firearm used in the shooting to determine who purchased the gun and where," Colbrun added, but she declined to disclose the results of the investigation. A woman who identified herself as Aghdam's aunt later described the 39-year-old woman as a "really good person" who had no history of mental illness, according to the AP. Officials with the San Bruno Police Department determined earlier Wednesday that Aghdam had "absolutely no link or relationship" with anyone on the scene of the shooting. Rather, law enforcement said, "She was upset with YouTube." "We've determined that right now, that's the motivation that we've identified," San Bruno, Calif., Police Chief Ed Barberini said at a news conference Wednesday. "Whether that rises to the level of terrorism hopefully will be determined in the next couple of weeks." Barberini added that the shooter had registered the semi-automatic handgun recovered from the scene. Investigators have also learned she stopped in at a gun range Tuesday morning. Later that day, at 12:46 p.m., police began receiving reports of gunshots — and within two minutes, officers arrived on YouTube's campus to find employees fleeing the scene. They soon found several injured victims — as well as the body of Aghdam, dead of what law enforcement believes to be a self-inflicted gunshot wound. "At this point, we have no indication that she was selecting individuals to fire at," Barberini added. At the same time, Aghdam left little doubt about her grievance with YouTube. Aghdam had frequently posted her own videos under a pseudonym on the platform — featuring a vast array of eclectic content, from exercise instruction to pop music parodies, spoken in English, Farsi and Turkish — and she said YouTube had begun "filtering" those videos to reduce the number of views and her advertising revenue. Those videos have been removed from the site. Facebook and Instagram have taken down the photographs and other materials she posted to those websites, as well. Her apparent website, meanwhile, featured her now-defunct videos, materials supporting her vegan beliefs and often-graphic footage of animal abuse — along with a vitriolic statement making clear her feelings about YouTube. "BE AWARE! Dictatorship exists in all countries but with different tactics!" the statement read, going on to quote Adolf Hitler and claiming that "videos of targeted users are filtered & merely relegated, so that people can hardly see their videos!" Elsewhere on the page was the claim that "close-minded youtube employees ... began filtering my videos to reduce views & suppress & discaurage [sic] me from making videos!" San Francisco member station KQED reports that her father, Ismail Aghdam, told the Bay Area News Group that she "hated" YouTube and that he had reported his daughter missing on Monday after she didn't answer her phone for two days. As for the victims of Aghdam's attack, Zuckerberg San Francisco General Hospital said two of the three patients the medical facility had received were discharged Tuesday night. The other, a man in his 30s, remains in serious condition, according to a hospital statement emailed to NPR on Wednesday morning.